After the success and excitement of our May Baseball Reenactment, The Historic Village at Allaire is presenting a new event for the 2014 season! Celebrate the rich history of baseball at our a double header 19th Century Baseball Reenactment on Saturday, August 16th, 11am-4pm. 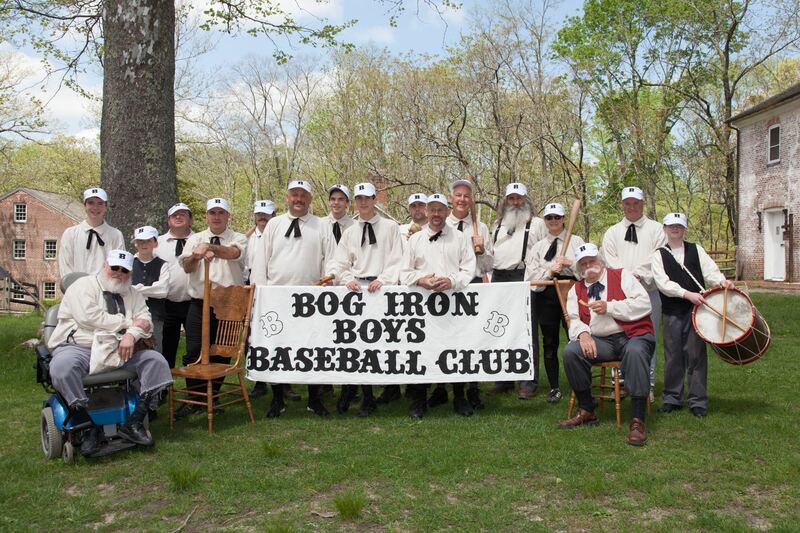 The Allaire Village Bog Iron Boys will play the historic Elizabeth Resolutes who have been kind enough to travel to Allaire’s industrial Village for an afternoon game! The game will be played by 1864 rules, with 1800’s vintage costumes and fun! The area surrounding Allaire is filled with baseball history, learn more at this event filled with family fun! Join the Villagers and come cheer on your home team! The events begin at 11am where the Villagers will call out the players from the Historic Village. The team will lead Villagers to the Show Field, where the games will take place! In addition to the games, activities throughout the day include exhibits of baseball history, craft demonstrations, and 19th century games for the kids, and more! While you’re here, be sure to visit the Historic Homes and Trade Shops. Snacks and refreshments will be available for purchase in the Bakery, and the General Store will be open for shopping from 10am-4:30pm. Bring lawn chairs and blankets and plan to spend the whole day at Allaire! There is a $5 parking fee for this event, all Village activities and the Baseball Reenactment are presented free of charge! For more info, call 732-919-3500 or visit www.allairevillage.org. Allaire Village, Inc. is licensed by the State of New Jersey to operate the 40-acre, state owned Historic Village at Allaire, site of James P. Allaire’s Howell Iron Works Company in the 1830’s. Allaire Village, Inc. receives no state funding towards the educational programming presented throughout the year. These programs are made possible by the support of private donations, membership fees, fund-raising events, admission fees, and patronage of our General Store andBakery. The Interpreters’ Program is made possible by a grant from the Provident Bank Foundation. Other generous sponsors include the OceanFirst Foundation and Cauldron and the Cupboard in Point Pleasant Beach. The Historic Village at Allaire is located at 4263 Atlantic Ave, in Farmingdale, NJ off Exit 98 of the Garden State Parkway and off Exit 31-B of Interstate 195. For more information contact the Allaire Village office during business hours, Monday through Friday, 9 a.m. to 5 p.m., at 732-919-3500 or you can visit us on the web at www.allairevillage.org.